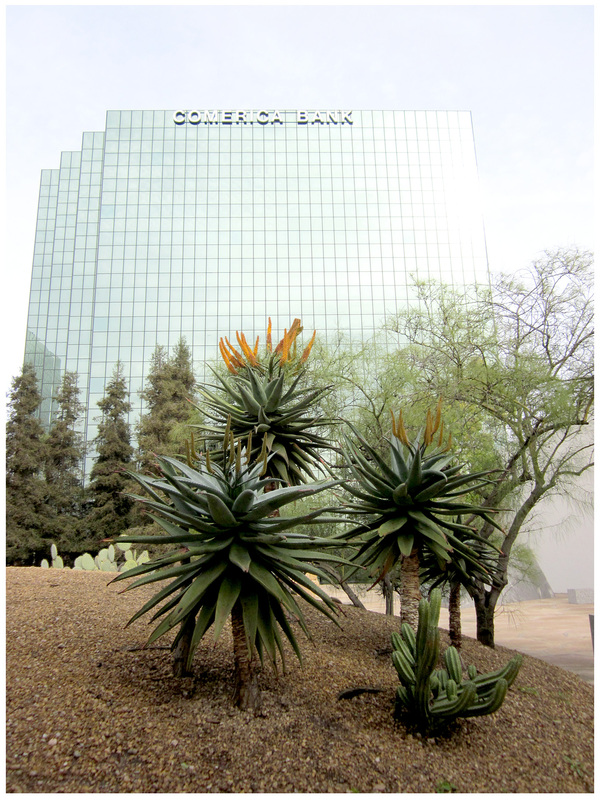 On the berm, these remarkable tree aloes may be considerably smaller than the sleek office towers they share space with, but their wild spikiness — their essential aloe-ness — easily stands up to them. Their texture, sculptural structure and beauty, to me, far surpasses any glass fronted box, no matter how massive. I love these plants and their primordial beauty …. 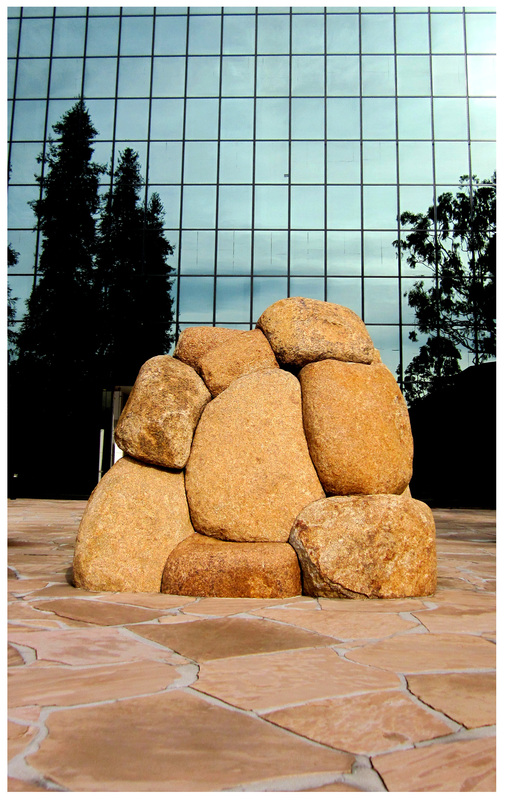 ‘Water Source’, a 30-foot tall sandstone wedge, depicts the mountainous source of California’s water. 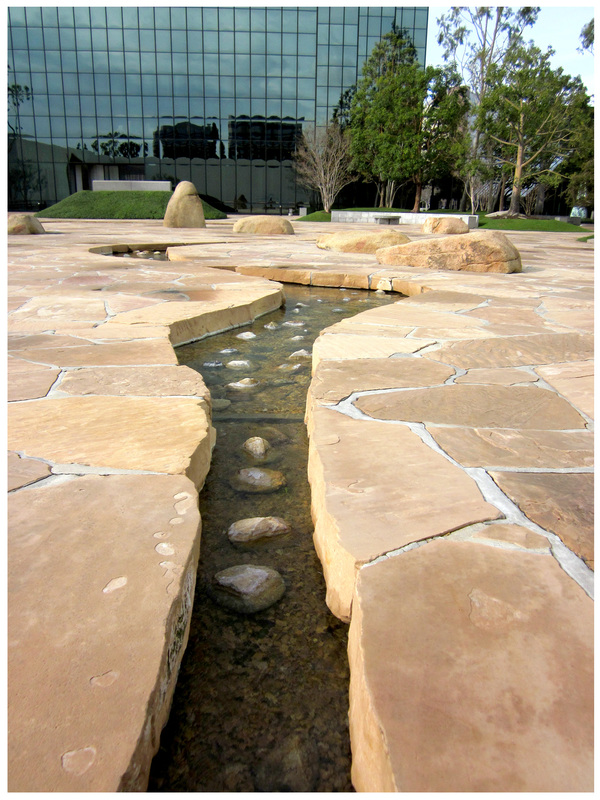 Like melting snow, the cascade rushes down the wedge, over river rocks and into the stream that courses through the plaza/landscape. 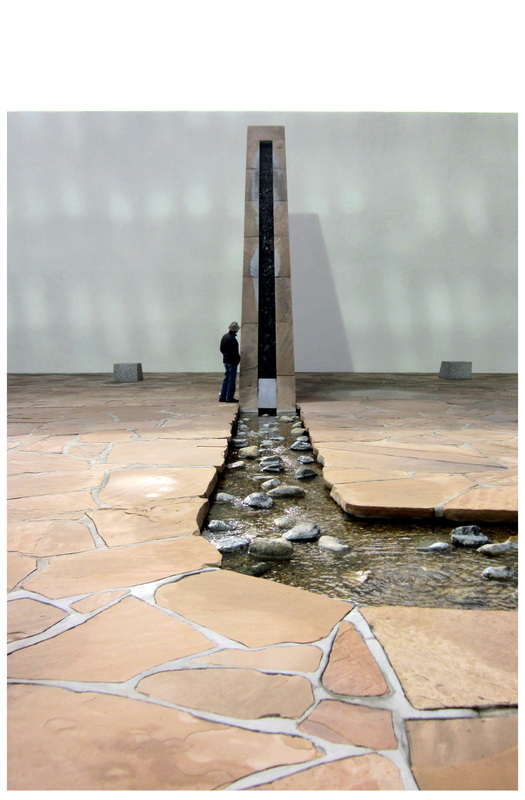 ‘Water Source’ is a free-standing, massive presence in the plaza; awe inspiring, really. 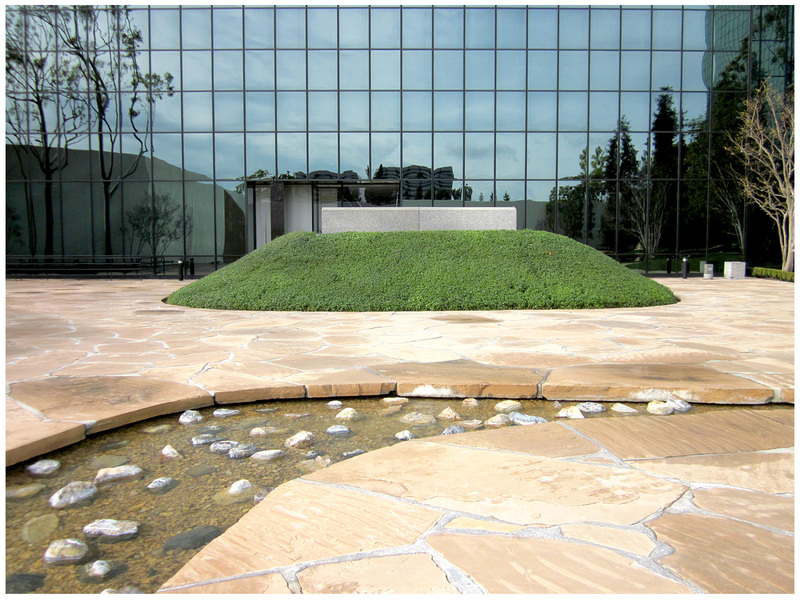 ‘Land Use’, while serene, has an almost funereal air about it; the feel of a Native American burial mound of some sort. Adding to that feel, is the carved granite topper with its casket-like form. Another perfect structure in the structure, I can’t help but marvel at Noguchi’s exacting vision. 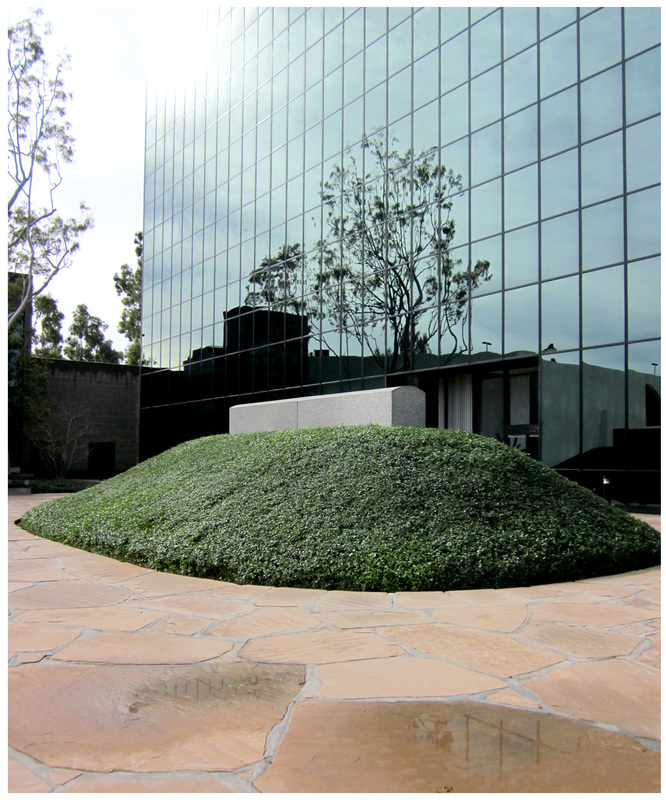 ‘Energy Fountain’ is a stainless steel cylinder atop a conical form of intermittently chipped Rockville granite. 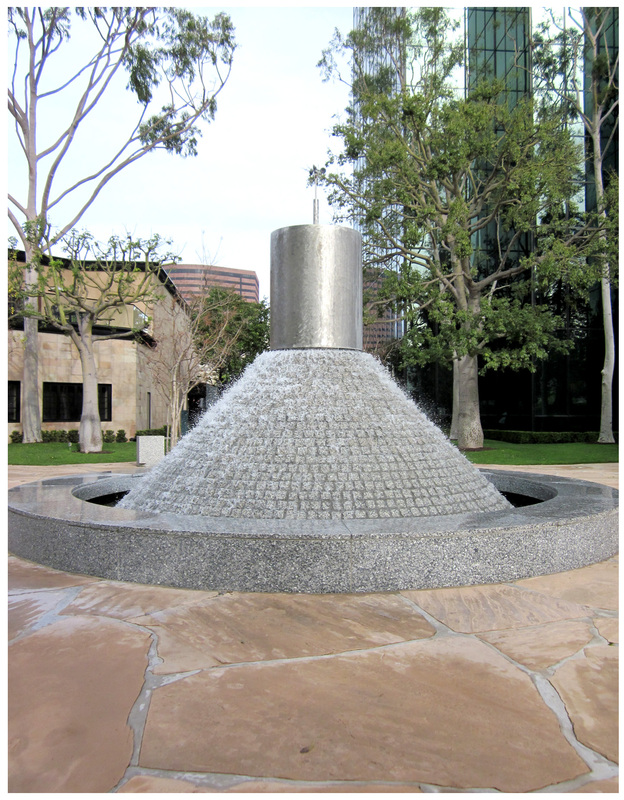 This fountain reminds me of a giant battery or turbine, and it pulses with an energy appropriate to its title. Encircled by a perfectly carved granite ring and sporting a cup anemometer for measuring wind speed, it’s both natural and mechanical at once. 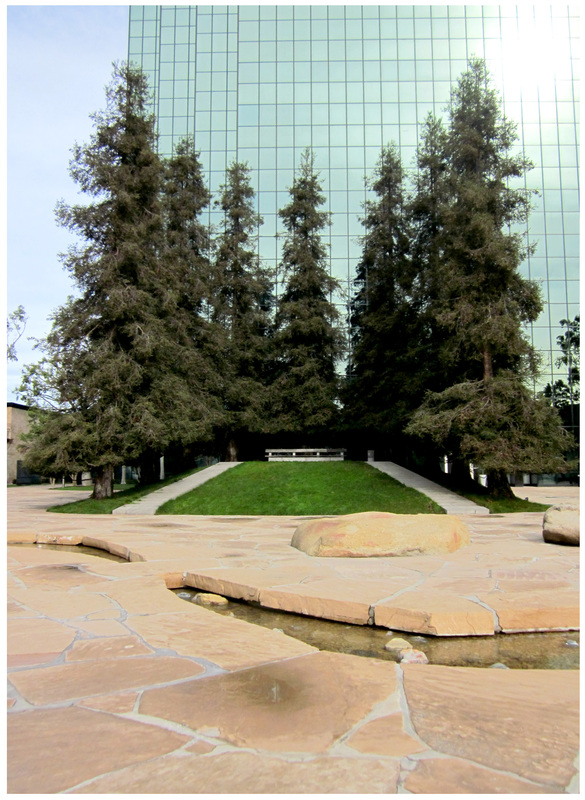 Of all the improbable elements in the plaza, a perfect stand of California redwoods, might be the most improbable of all. 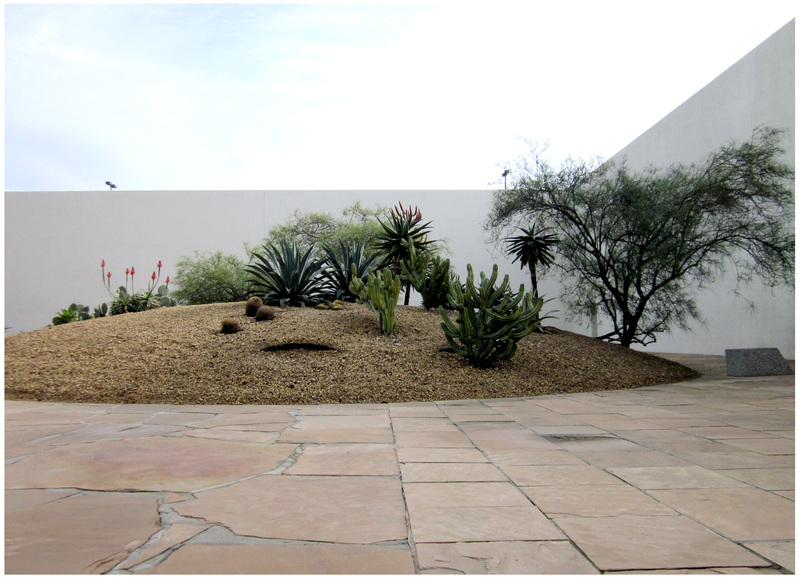 Called ‘Forest Walk’, the trees edge an elevated planted mound with a granite walkway. At the top of this path a wooden bench awaits contemplative visitors. The redwoods stand tall; equal parts sentry and protector. Not as tall now as they will be, I expect they will exceed in height the tower they face. Another view of the ‘Water Source’ underground waterways. Mini-waterfalls and rapids rush over smooth round rocks inside the fissure-like openings, creating a calming whoosh of a background sound. Calming is a word that describes ‘California Scenario’ perfectly, in fact … Other improbably perfect adjectives are: surreal, grand and embracing. My overall impression was that of being a small figure inside a diorama, or maybe a game piece inside some kind of educational boardgame. Pleasantly weird and totally gorgeous. 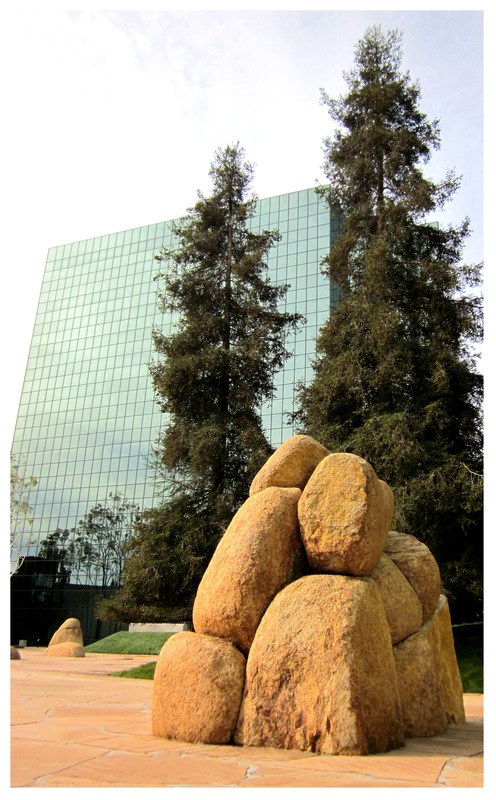 An improbable garden and artistic statement, in an improbable location near a major shopping center (South Coast Plaza), depicting an improbably enormous and diverse state, Noguchi’s ‘Scenario’ is worth seeking out. 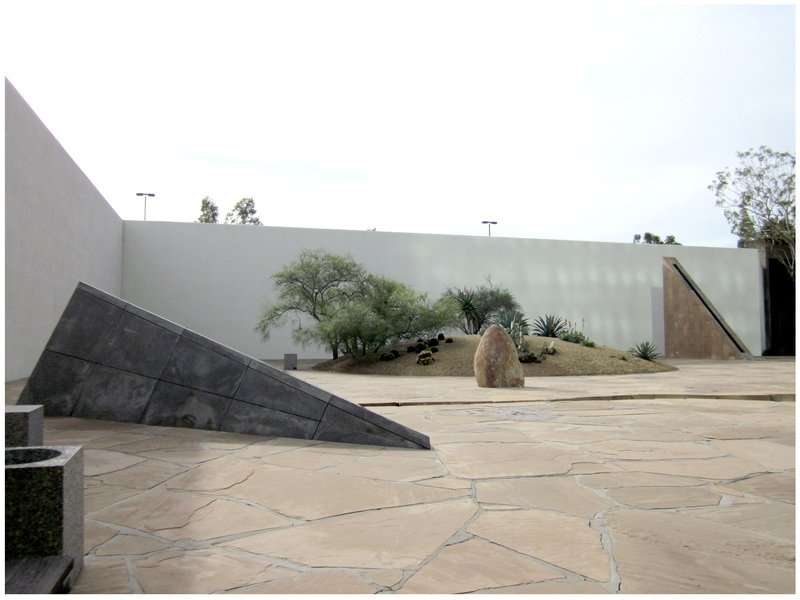 The garden is located at 611 Anton, Costa Mesa, CA 92626; easy directions: take Interstate 405 San Diego Fwy to Costa Mesa, exiting east at Bristol Street, then turning right on Anton, then right again on Park Centre Drive (bordering the sculpture garden). An improbable landmark to look for? : TGIFriday’s restaurant … if you see Friday’s, pull into the parking structure behind it, and you’re there. Go … I know you’ll enjoy it! My husband and I were married at Forest Walk 22 years ago, with Segerstrom approval of course. I will have to dig out the photos to see how much the redwoods have grown. It was such a pleasant surprise to open RanchoReubidoux this morning to see this facinating place. So hidden, so special. It was lots of fun to be there back then, in the Summer their were small concerts with the restaurants surrounding selling sandwiches and drinks. There was always a nice breeze there too. I’m more than a little ashamed that this was my first visit! Good call; I’ve only seen Goldsworthy pieces in pictures but I always think: what would I feel in the presence of such man-assisted natural grandeur? I saw the tree aloes in your Santa Barbara post and they were spectacular! i lived in oc for about 15 years and lived about 10 miles from this cool space before i sought it out and visited it. so worth the effort! Wonderful garden visit post. 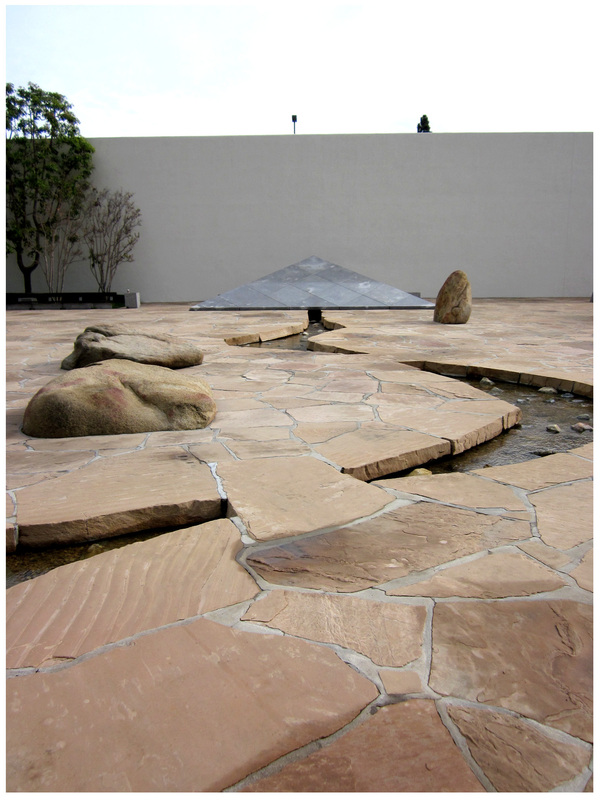 Noguchi seems to have absorbed the essentialness of California, the subtle landscape that’s become almost invisible, like all the paved over creeks he alludes to. A bracing garden, bittersweet and beautiful at the same time. I love his stark titles — “Land Use” and “Energy Fountain” — dark humor referencing exploitative attitudes toward our Golden State? Thanks, Denise … I think a lot of people think of Noguchi as a Japanese native, when he was actually born in Los Angeles. Although he left here as a very young child, I like to think of him as a Californian, already having ‘absorbed the essentialness of California”, as you say.